In its earliest stages, Keratoconus, often abbreviated to “KC”, in a non-inflammatory eye condition in which the normally round dome-shaped cornea progressively thins causing a cone-like bulge to develop. This results in significant visual impairment. The cornea is the clear window of the eye and is responsible for refracting most of the light coming into the eye. Therefore, abnormalities of the cornea severely affect the way we see the world making simple tasks like driving, watching TV, or reading a book difficult. Keratoconus causes slight blurring and distortion of the vision and increased sensitivity to glare and light. These symptoms usually first appear in the late teens and early twenties. Keratoconus may progress for 10-20 years and then slow or stabilize. Each eye may be affected differently. Eyeglasses or soft contact lenses may be used to correct the mild nearsightedness and astigmatism caused in the early stages of Keratoconus. As the disorder progresses and the cornea continues to thin and change shape, rigid gas permeable contact lenses are generally prescribed to correct vision more adequately. The contact lenses must be carefully fitted and frequent checkups and lens changes may be needed to achieve and maintain good vision. The actual incidence of KC is not known. It is not a common eye disease, but it is by no means rare. It has been estimated to occur in 1 out of every 2, 000 persons in the general population. 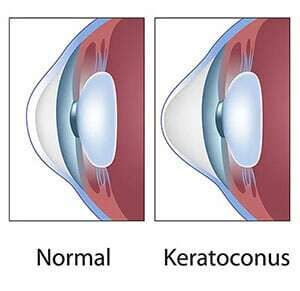 Keratoconus is generally first diagnosed in young people at puberty or in their late teens. It is found in all parts of the United States and the rest of the world. It has no known significant geographic, cultural, or social pattern. Insurance companies may cover all aspects of the procedure for keratoconus. Since this is a new indication, some insurers may not yet recognize this procedure for treating keratoconus. Addition Technology is working to educate insurers on the importance of the Intacs procedure for treating keratoconic patients. You and your doctor may in some cases also need to help educate your insurance company. For more information and assistance, please visit our website at http://www.intacsforkeratoconus.com. 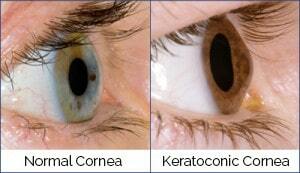 If you are seeking professional help for keratoconus please call our keratoconus eye center in Cleveland. Although your eye care professional is the best source of information, you may want to conduct your own research on keratoconus. A good place to begin is the National Institutes of Health at www.nei.nih.gov/health/cornealdisease.